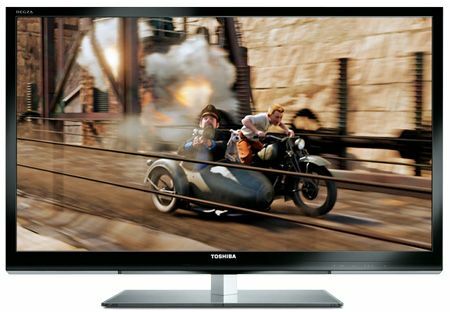 Toshiba 37UL863 review | What Hi-Fi? time of it lately. If there’s been any consistency in its products over the past couple of years, we certainly haven’t noticed it. So while we’re not yet prepared to go so far as to suggest the 37UL863 represents an overall return to form, it’s definitely a good start. Unless you’re in the market for a 3D TV, the LED-backlit 37UL863 is amply specified. Highlights include three tuners (analogue, Freeview HD and Freesat), USB recording and a comprehensive suite of online facilities the like of which Toshiba TVs haven’t previously featured. Thanks to a workable remote control and some tidy on-screen menus, the 37UL863 is simple to set up. We would recommend keeping the Toshiba’s motion-processing options firmly in their box; then, the 863’s capable of lustrous, convincing images. The remastered Jurassic Park Blu-ray, for instance, looks splendid: vibrant, high-contrast and detailed, with decent control of movement and particularly enjoyable skin-tones and textures. It’s equally enjoyable when fed a decent TV signal. BBC One HD via the Freesat tuner is crisp and clean, with strong white tones augmenting a nicely neutral colour palette and impressive edge definition. Darker scenes scenes reveal slightly uneven backlighting, but it’s pretty benign compared with some rivals we could mention, and doesn’t notably impinge on picture quality. This is a decent set for the gamers out there as well. There’s no noticeable lag when playing – chiefly because there’s little processing to be negotiated. The Toshiba is as capable a DVD upscaler, too, as the most accomplished budget-end disc-player. got yourself an all-rounder that looks like a good deal at the price.